For generations, our schools have been welcoming places to learn and to become new civic leaders. Barry Thomas asks an important question about what state leaders want to say about them today. The idea is to ease nerves and bring calm. The aim is to create an atmosphere of comfort. A family and student will see smiles everywhere they turn. Some high schools even bring out the bands and cheerleaders to create a pep-rally atmosphere. The message is clear at these “Open Houses” that — though the terminology of schoolhouse may be outdated — the design still prevails. This is home. There is reason and science behind this: All pre-service educators learn about the great American psychologist Abraham Maslow and his Hierarchy of Needs. There are five levels of needs according to Maslow; the lower the level, the more basic the need. Next in line after water, shelter, and clothing is safety, followed by belonging. The premise is simple; if kids are hungry or cold, they can’t focus on math and science. They must have those core needs satisfied before they enter a building. Upon entering that same building, they need to feel that this is a place filled with students and adults who will care for them and make them feel included in the learning. That is the core of every schoolhouse. Developing a positive relationship with students is paramount to learning. All those invested in child development are focused on these basic needs before they consider a bell schedule, a statewide assessment, an IEP plan, the sequence of their state standards, or any other educational component. Educators get this. But do those who set the policy and laws for educators? There is a message currently being sent by Nebraska policymakers about how they envision the atmosphere around our schools. Several pieces of legislation were introduced this year that have sent a message about how welcome our students should feel in the schoolhouse. LB147, the Student Discipline Act, was submitted for the Education Committee to consider how educators handle physical contact and restraint. Ironically, the bill removes the possibility of any legal recourse or administrative disciplinary actions that could be taken against school staff who may have used force with a student. The bill goes further to establish guidelines for removing disruptive students. Though it seems reasonable to give teachers the ability to break up a fight or to intervene if a student is hurting themselves, as a parent and an educator, I have to wonder about the situations where an action is excessive and the staff member causes more harm than good? As a parent of school-aged children, I absolutely want my kids and everyone else’s kids to be safe. But that safety is not limited to them and other students; I want my children to be safe from an aggressive adult, as well. There are far too many instances of adults in schools slamming young children to the ground, bending their limbs in unnatural ways, and forcing elbows and forearms into their backs, necks, and heads. This kind of treatment can be traumatic, but also bearing witness to these actions is in opposition to what the Hierarchy of Needs suggests we need to establish safety. Another bill goes even further. LB343 intends to give teachers the ability to carry concealed weapons in the classroom. Thinking back to the safety and sense of belonging that we expect your children to have in school, an argument can be made that seeing teaching staff armed with guns could make a student feel at ease if a threat approaches. One could counter that argument that if it gets to the point where a threat is on the premises, students are already likely far beyond a feeling of comfort. We also have seen instances where trained military personnel, law enforcement, and security staff have made fatal mistakes in judgment by misfiring or overreacting. An educator is probably even less prepared and trained for high-stress situations. If LB343 and LB147 are made into law, one is led to question if an injury is sustained by a student from a staff member using a firearm, would that individual be excused from being placed on administrative leave or seeking legal recourse? The larger question is What’s the message? Will our state continue along with the Maslow-inspired expectations that have been best practice in education for decades? Are the most effective educators the ones who provoke fear or those who inspire creativity while building respectful relationships? Do we want our schoolhouses to be warm places of smiling teachers with open arms or teachers shrouded in firearms? What is the message that we are sending to our babies about how their educational institutions should welcome them? 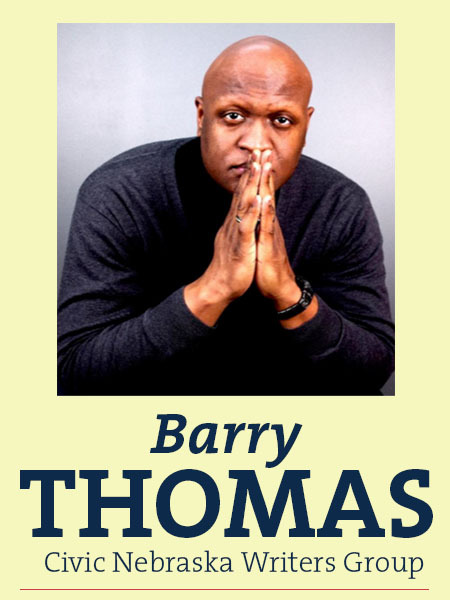 Barry Thomas is supervisor of social studies for Omaha Public Schools and is a former teacher at Omaha North High School and McMillan Magnet Center. He is immediate past-president of the Nebraska State Council for Social Studies, a member of the Nebraska Advisory Council for National Geographic Society, and board member of the National Social Studies Supervisor Association.